Be it at a wedding reception or a birthday party or a anniversary celebration or any grand occasion, there will always be some soothing instrumental music by guitar maestro/genius Patrick Pereira played either by the sound guy or the DJ. I am a big fan of Patrick, and I own all the four instrumental music CDs released by him- my mornings are incomplete if I don't play Patrick's religious music CD. And one of the reasons I love him so much is because his music has such freakin' awesome guitar bits. Every time I listen to some of his instrumental tunes, I marvel at how every note of every guitar lick or solo seems absolutely perfect. The craftsmanship is impeccable. It was indeed a great pleasure for me to have close encounters with Patrick Pereira for an exclusive interview of his journey in the field of music, his practice habits and his musical influences. Go ahead. Ask musician/guitarist Patrick about his music gigs; Ask him about jamming with other musicians; Or about sharing the stage and/or studio with the likes of everyone from Konkani� to Western bands. Ask him about all that, and you know what he will most likely do? He�ll probably shrug his shoulders, smile, and say in his soft humble voice, " I love music, I create music and I want to play music as long as I can".� The fact of the matter is, 49-year-old Patrick has made�and continues to make�some incredible music. His fluency in an array of styles, combined with his easy-going attitude, make him a picker�s picker, the kind of musician other musicians admire and dig playing with. Some of Patrick's solo renditions are powerful, yet tasteful; As amazing as it is to listen to his CDs, you got to watch him perform live either during a concert or when he plays for his own band "Patma Live"- a band for all occasions started 15 years ago.. Most of the band members are family members comprising of Patrick (Guitar/vocals), along with his wife, Wilma (vocals) and son, Patson (drums). The other band members are Loy (Keyboard), Rikhit (Bass guitar) and Jithesh "Jeethu" (Vocals).They are continually growing in stature and the odds are that such interest is just a taste of what is to come. The band wants to concentrate on their live performances. This is evident when watching them, as it is here where they shine. It seems as if the stage is a place for emotional release, where they can perform without concern or compromise. The musical chemistry between the band musicians is clearly evident. They are all equally competent and fill the role extremely well. The main motto of Patrick is to render the best music he can provide along with his band crew , to please the crowd, keep their reputation and anticipate good remarks from their audience. "Hard work, ignore what anyone else is doing how well or badly they are.� Focus on what we are doing-perform live at grand occasions and make friends. Learn music trade through time and patience, and when we have done the best job someone will notice" says Patrick. Patrick's band has reached greater heights through their intensive practices, thoughtful lyrics, and mesmerizing the crowd with their impeccable performances. The band is essential in creating the energy and momentum that inspire the organizers and audience alike. According to Patrick,"Performing live is always precarious. You�re on your toes to make sure things don�t go wrong, and it�s amazing that things don�t go wrong all the time. But there are fantastic people working to make it turn out well.� Although he has made three music CDs and now leads his own band, Patrick will remain revered for his contributions to works bearing the names of more famous artists. His intensely melodic music has propelled him into limelight for the so many years. As Patrick's skills and reputation grew, he developed into a professional guitarist, and also mastered in other musical instruments. Some of his guitar renditions are perfect example of powerful, perfect guitar orchestration, a stunning and rarely equaled essay i tone, strength and immediacy. There are quite a few music lovers who consider his playing techniques simply the best on the planet. In many ways, it's a "Dream Come True" kind of story for Patrick, where he has stayed true to it through all the highs and lows. "The opportunity and chance to actually make life for yourself is based on how hard you want to work" says Patrick. He has felt that way from the very young age that how opportunity and chance can get connected with music. Nevertheless, it was by no means an easy ride- but working through all the hurdles, right now he feels proud of his achievement and and success in the field of music. Q : What inspired your passion for music and who has been there supporting you from the beginning? 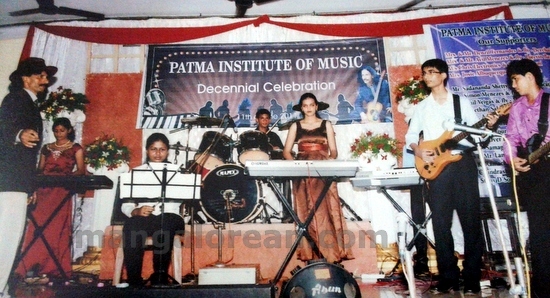 At the age of six, I used to win in many music competitions in School & under other banners. This created� a passion for me in music. So I developed my own liking for music and I wanted to be a musician. Rest was all history- and here I am enjoying my music talents and also sharing it with others, by training those who want to learn music. Q :I know that you have come up with few of your music CDs- but many a times people don't buy them, instead download from other sources-How do you feel about people downloading music rather then buying original copies? For this generation and the growing technical world it is hard to stop piracy. But I would still suggest that people should buy originals ND support the hard of the artist/musicians. Downloading music released originally by the music artist is like stealing. Music lovers should stop this habit, instead patronize and support the music artists in buying their music products. Q: How do you feel about the music industry today? How about the progress of Konkani music these days? Q :Where do you see yourself five years from now? In five years from now, or could be earlier than that , my plans are to have international tours and give a unique music performance, which no other artist has done before. For this I need all the support and blessings from my fans in particular and other music lovers in general. With support and encouragement I surely can attain my goal. Q: Do you think singer/songwriters are the best interpreters of their own work or do you believe some cover versions can be better then the original? Yes singers and songwriters are the best interpreters, because original composition has got more value and more identity than doing cover versions. Q :As you are starting out your career in the music industry what steps do you plan on taking to reach your goal? I would like to have more experience in the music field and learn more and more music, thereby pursue masters in it. I am anxiously looking forward for that moment to arrive. Q : If you could have asked anyone for advice when you were starting out. Who would you have liked to ask? What would you have liked to ask? What would be your answer now? I would like to ask a person who has got a lot of experience in the music field. I would also like� to ask the tactics and some innovative ideas . Q : From your experience in the entertainment industry what advice could you offer people looking to get where you are today? Hard work and great passion in exploring music can reach the people to great heights. Aim at something good in life, work hard to accomplish it, and surely all success will be yours. Q :What courses/classes would you recommend someone to take if they want to be a professional in the music field ? I would suggest someone to start with a proper basic with theory and notation. Get training from a music teacher, practice daily what you were taught by the teacher. Q :How many years were you fighting to get to where you are today and what was that time in your life like? Q : From your experience so far, what have you found to be most challenging? And how are you dealing with it? Most challenging moment was to take a placement in guitar learning from drumming . I made it and enjoy playing my guitar. Q :Share with us your proudest moment in your career so far? Playing with Bollywood musicians and singers. Q : Having know that you also have a band, What aspirations do you have for your group? Q : Can you tell us about the formation/reformation of the group? What made you and how did you all got-together? Through music friendships and contacts and by jamming together . Q : How many music CDs have you released so far ? Are you planning on releasing any new CD shortly?� What's next stored for you guys? Any upcoming events? Q : Are you proud that you are a musician now ? What if you weren't a musician, what would you be doing or what do you think you'd be doing? Q : Learning how to play guitar can be rather intimidating for beginners, what advice would you give someone starting out who wants to be a great instrumental guitarist? I guess the best advice is to stick with it and it will happen. It may take a very long time and I'm still struggling and practicing after so many years but it's something that I love to do so its time well spent. Look at the long term and realise that any goal you may have is achievable even if it takes decades. As long as you're getting the desired result emotionally from what you're doing it's very much worth the effort. Q : I always believed that there is no wrong or right way to practice and that the goal of a musician is to learn how to tap into their emotions. How do you feel about practicing and can you offer any advice to get the most from practicing? I suppose making sure you keep working on things that you need to work on rather than returning to what you do best. Then again, if doing what you do best is providing you with a career and people are lining up to see it then by all means continue doing that. I do however consider myself very fortunate to have had a career as a professional musician for as long as I have so I'm not complaining. I just would've hoped that my own music and what I consider to be my own original approach to playing the guitar could have provided me with a career which would allow me to just be myself. I've made originality my main focus all my musical life so trying to do the things that other people do is a struggle for me. I find it much easier to be original. Q :What would be your words of wisdom to the budding musicians? Be innovative with full of inspiration,� to create unique music because music is a never ending story. Hard work and dedication will bring big achievements. Don't quit where you started. Team Mangalorean wishes Patrick and his crew all success in their music ventures, and also requests our readers to encourage and support local music artists in their efforts to promote Konkani and other kinds of music. A really beautiful article. Keep up the Good work Mr. Patrick Pereira!!! God bless all your efforts!!! Delighted to read the detailed article on Mr. Patrick Pereira and his family. He is one of the most inspiring and brilliant musicians yet a humble person. I wish him bright future.